Do you dream of taking on ski slopes like a pro, dodging, ducking, and weaving down a beautiful mountain covered in powder white snow? Well, you can make that dream into a reality at the Brian Head Ski School during your trip to Southern Utah! Their expert staff and teachers will show you how to ski like a pro in no time through one of their classes. Choose a group lesson, private lesson, or a package deal of rentals, lift tickets, and classes! Your kids can even learn how to ski at one of their Kid’s Camp group lessons! It’s about time you got out and experienced the rush of skiing, why not do it on some of the best slopes in the country? While you’re not on the slopes learning how to ski, explore the bevy of gorgeous sights and attraction in our area with your own free Southern Utah Vacation Guide! It has everything you need to know in order to plan your trip to our outdoor paradise! If your little ones want to learn how to have fun and stay safe in Southern Utah this winter, send them to the Brian Head Ski School. Kid’s Camps are available in full or half-day packages and include a lift ticket, equipment rental, and lunch. Book your child’s reservation online at least 48 hours in advance. Both children and adults can also take private lessons at Brian Head Ski School. Skilled instructors take you step by step through the basics of skiing while tailoring the experience to fit your specific skillset. You can book a lesson ranging anywhere from two and a half hours to six hours long. This is great for beginners who want a personal touch while learning to ski. Brian Head University provides guests with a complete ski experience! This package deal includes three group lessons, three lift tickets, and three days of rental equipment so you can practice your newly acquired skills on the slopes the same day as your lesson. They guarantee you can ski or snowboard in just three lessons or you receive a full refund. 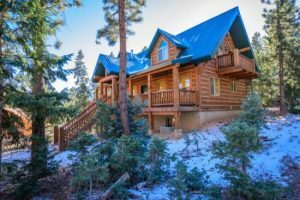 Head back to your cozy Family Time Vacation Rentals property after a day of learning how to ski at the Brian Head Ski School. Our collection of homes and condos offer unparalleled amenities and locations, giving you opportunities to explore the top-notch selection of national parks and natural wonders in Southern Utah. Our Brian Head rentals put you steps away from the ski lifts so you can enjoy the slopes all day. If you’re looking to try something a little new with fewer crowds, skiing at night is an excellent option. So, what are you waiting for? Get out here and experience the Southern Utah slopes for yourself! We can’t wait to have you!